You’ve heard by now that Johnson & Johnson is among the many companies that currently sell baby (and adult) products that include toxins such as formaldehyde and other carcinogenic ingredients. For example, the iconic Johnson’s Baby Shampoo contains dioxane and a substance called quaternium-15 that releases formaldehyde. Dioxane is 1,4-dioxane is a petroleum-derived carcinogenic compound that is used intentionally in dry cleaning solvents, lacquers and automotive coolant. 1,4-dioxane also shows up in personal care products because it is the byproduct of some chemical ingredient manufacturing processes, including the process by which sodium lauryl sulfate becomes sodium laureth sulfate. 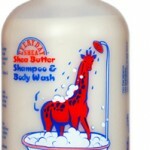 The latter SLS is used in products that make suds, like shampoo, bubble bath and body wash. Remember to check your labels! See the Campaign for Safe Cosmetics database for more here. Quaternium-15 releases formaldehyde into cosmetics products. Formaldehyde is classified as a known human carcinogen by the U.S. Department of Health and Human Services and the International Agency for Research on Cancer. The National Cancer Institute, the World Health Organization and the National Toxicology Program have all identified a possible link between formaldehyde exposure and leukemia. See The Campaign for Safe Cosmetics database, Baby’s Tub is Still Toxic. The really galling part is that some countries have banned the use of 1, dioxin so J&J actually makes two different versions of its products since the EU has banned chemicals in the U.S. version. Read this important report HERE, the first to document the widespread contamination of children’s products with formaldehyde and 1,4-dioxane. For our 4 month old’s tub, we like Everyday Shea’s shampoo and body wash. It was (very surprisingly) the only acceptable, nontoxic shampoo for babies that I found at Whole Foods with the exception of good old Dr. Bronner’s Unscented Baby Mild Soap, which you can use for just about anything. We use Dr. Bronner’s to clean bottles and bring it in bar or liquid form when we travel. It’s great for handwashing baby clothes too. Click on the links below for more detail on why these are harmful from the Campaign for Safe Cosmetics.